Alicante’s cuisine is typically Mediterranean, the fertility of its lands have provided an enormous richness and variety food. The Mediterranean Sea provides the freshest, best quality fish and shellfish and are a must for all visitors, such as the red shrimps from Alicante and the king prawns, crayfish, squid, red mullet, and many other types of seafood. Before sitting down for a meal, appetisers are the best thing to whet your appetite nothing better than the traditional tapas and montaditos, with a variety of toppings, typical of this area. Rice plays a leading role in a huge variety of meals, although many other ingredients are also used in the preparation of traditional recipes: Arrow a Banda, a rice dish with seafood, arrow caldoso, a brothy rice dish with seafood and the popular olleta rice dish with meat and vegetables. 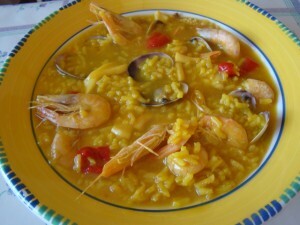 El caldero, a seafood stew, is a meal in itself and is the typical dish of TabarcaIsland. It consists of rice stewed with (monkfish, eel, mullet…) with the fish, normally accompanied by rich, fragrant garlic all i oli. Alicante is also renowned for its savoury pastries known as coca and tonyina, as well as its esmorzaret made with salted sardines, fried egg and ñora peppers. 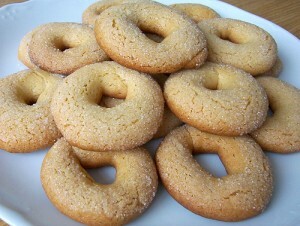 For dessert there are more products to enjoy, including aniseed rolls, la coca boba sponge cake, dates and dried fruits. Not forgetting the famous ice creams and the turrón de Jijona nougat or the delicious chocolate from the neighbouring town of Villajoyosa. The dinner table would not be complete in Alicante without wine. Dark full bodied reds, rosés and young whites made from grapes of the Monastrell, Vermeta or Garnacha varieties and el Fondillón, a world-famous aged wine from Alicante. The restaurants of Alicante have kept up the tradition of a rich and sensual cuisine, which has been recently up- dated to offer innovative versions of traditional products and dishes.